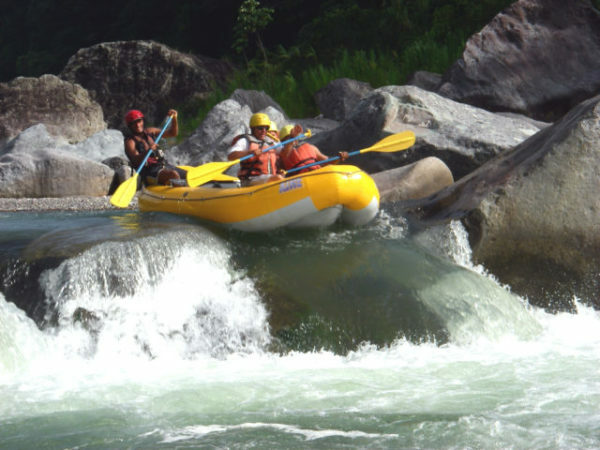 Outstanding white water rafting is available at the Cangrejal River! There are Many Different Activities Available Near La Villa de Soledad! Our La Ceiba hotel is in the Cangrejal River Valley. This unique area where the variety of nature and adventure activities is astonishing. You will not find find an area as small as the Cangrejal River Valley where you could find so many activities available, all close to each other. Best of all is the fact that the Cangrejal River Valley is so close to La Ceiba that it is truly easy to get to! An all weather dirt road leads from La Ceiba to the several communities upriver. These include El Naranjo, Las Mangas, El Pital, Rio Viejo, Yaruca and a few others. The majority of tourism infrastructure and services are between the communities of El Naranjo and Las Mangas. These communities are located roughly between 5 and 9 miles from La Ceiba. Adventure activities available include white water rafting, zip line canopy tours, waterfall descents and rappelling, mountain biking, horseback riding as well as river hiking. These activities are available within walking distance of the Hotel La Villa de Soledad in La Ceiba. The nature activities available around La Ceiba, include world class bird watching and hiking. Both activities are within walking distance of our premises. Nearby, within 45 minutes in a vehicle, you can visit the Cuero y Salado Wildlife Reserve. The Cacao Lagoon and the Sambo Creek natural hot springs are also close-by. The pristine Caribbean Islands known as the Hog Cays or Cayos Cochinos are also within easy reach. As you see, there are so many different activities available near La Villa de Soledad that a week’s stay would not be enough to enjoy them all! Take advantage of all these wonderful activities available near La Villa de Soledad! Plan on spending at least three nights at this unique La Ceiba hotel.